Of course kids love it. But it's a really cool experience for adults, too. 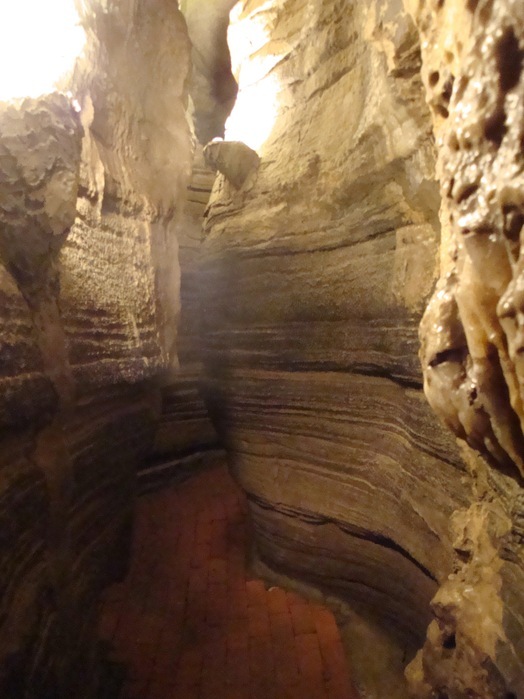 If you haven't been to Howe Caverns since your elementary school field trip, I can give you five reasons why you should go. 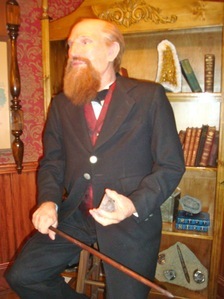 The new first stop on the cave tour -- new, as in, it just opened this past Saturday, and it still smells like cut lumber -- is the library of an animatronic Lester Howe. Holding a geode and a stick, the latex robot farmer welcomes you to the cave and tells you of its history. He blinks, he jokes, he simultaneously worries and fascinates the little kids. He directs our attention to a digital picture frame, where we watch a re-enactment of Howe discovering the cave by following his cows, who liked to rest on hot days near the cool air blowing from the cave's entrance. The frame's images are all oversized heads and cow kisses. But in a good way. 2. The weather, or lack thereof. The elevator takes you down into the cave, a couple hundred feet below winter. At a constant 52 degrees, it's warmer than being outside. And that's no small fact. 3. Take groovy cave photographs. My attempt at artsy photography. ... Yeah, I know: I'll stick to writing. Tours are 80 minutes long: plenty of time to challenge yourself to create some new art. Explore the artistic potential of blurred images, or experiment with all those low-light settings on your camera. Study how the shadows play in the sinuous hollows and curves of the cave ceiling. 4. Think about the bats. Howe Caverns had a small colony of about 500 bats, in a part of the cave not open to tours. Now there are four bats left. But that's nothing compared to the destruction of huge bat colonies in other caves. 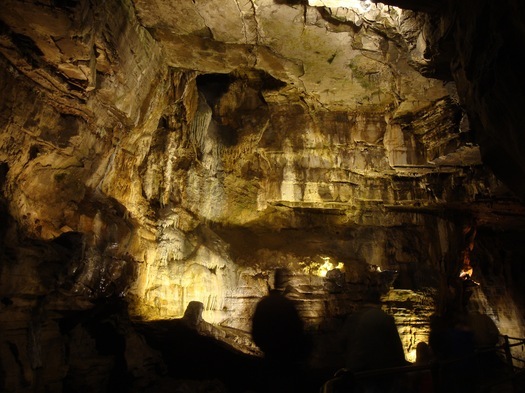 White nose syndrome, a disease that's decimating Northeast bat populations, was first observed in Howe Caverns. Researchers understand little about the fungus, which grows on hibernating bats. It's associated with a loss of the bats' fat reserves, which they need to survive hibernation. In a story last December, National Geographic speculated that the fungus, which is known in Europe but doesn't harm bats there, could have entered the cave on a tourist's shoes. More than a million bats have died in the United States in the past few years. Considering that bats devour more than half their body weight in insects every night, this disease could be devastating to our ecosystem. 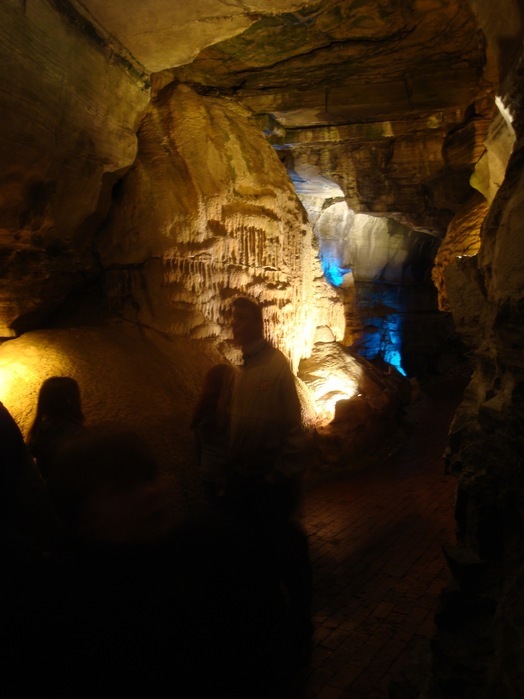 Howe Caverns raised more than $12,000 last year to donate to research, and you'll hear a pitch for contributions while you're in the cave. Besides talking about the bats, the tour guide will fill you in on other things, too. Some of it will be the same corny stories they've always told, like the Boy Scout and his frozen mouse. But there's some good science in there -- calcite and flowstone, floods and rockfalls, how the cracks in the ceiling were caused by the weight of glaciers passing above. 5. Dude, it's a cave! I mean, wow, you're underground. And you see things you can't see on top of the earth. Rock that ripples and flows. Forms that seem to quiver somewhere between liquid and solid. Take a meditative walk through the narrow paths of the Winding Way. Enjoy the calming sound of water echoing off stone. 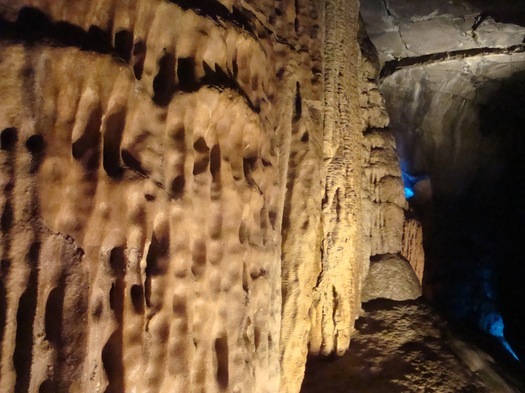 Howe Caverns doesn't have soaring stalagmites or jaw-dropping mineral formations of the sort you can see on some cave tours. But you know what? It's still awesome. It's a chance to hang out underground. Talk about getting a change of scenery. AOA, we have a spelunking budget, right? Because I might need to go back. I, like many people, haven't been there since elementary school, and I really have been itching to go back. It's a great thing to do in high summer, when temps soar above 90 degrees with humidity. Going by my memory of how much light is (more accurately, isn't) down there, those photos are great. I wonder if they let visitors bring a tripod down? @B -- Howe Caverns does say that tripods are not permitted. I, however, brought my "Gorillapod" and used it on the cave railings to help steady some of my shots. And I met with no objections. Can I put in a word for Secret Caverns? It's right around the corner from Howe, and although it is a little smaller I really like their more independent feel (have you seen their billboards, they're awesome!). They also have a waterfall. Yes, it's rumored that they close it off when no one is there to build up the flow and make it more impressive, but still, it's pretty cool. 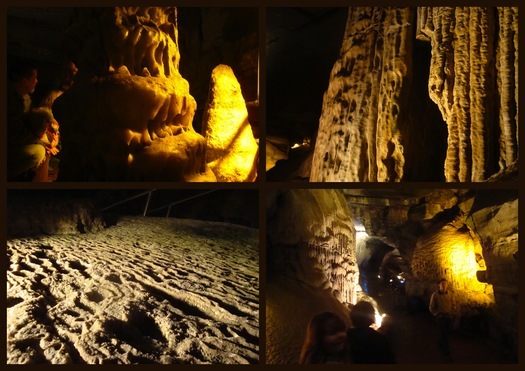 You can always make a caving day of it and go to both! Very good call on the Gorillapod, Akum, the pictures look pretty good. I have one, but it's not strong enough to support a DSLR. The website does indeed say "no tripod allowed", a rule I've seen elsewhere to prevent people from taking "professional" photos. Too bad. I have to echo Phoebe's mention of Secret Caverns - those funky billboards are what drew us in! And my husband proposed to me at the base of that underground waterfall; it will always hold a special place in our hearts! The Howe Caverns Lantern Tour is pretty rad! A few years back, in College, my girlfriend, me, and another couple double-dated had the entire cave to ourselves (well, except for the guide, who wandered off from time to time and never rushed us). I'd imagine that during this time of year, you won't have too many others booking the Lantern tour, so grab a few friends and reserve a Lantern tour. It is definitely an great way to see the cave. By the way, you've never experienced pitch black until you've been underground in a cave with an extinguished lantern.